There are many things that we can do now that we couldn't do ten or even five years ago. Thanks to the interwebs and the cheap availability of both high speed data connections and online data storage, it is now possible for Betsy and I to work together even though we live nearly a thousand miles away from one another. It also allows me to work from home on occasion when I feel like it or when the developer with whom I share my office is being especially loud or when his dog has pooped next to my desk. When I was home on Wednesday of this week I was pleasantly surprised when my in-laws stopped by with Sammy after school. There is about an hour in between when they pick up my eldest daughter from school and when my youngest daughter is let out, and on this particular day they decided to swing by the house. Luckily I was wearing pants and Sammy and I enjoyed an unanticipated playdate. There are both advantages and disadvantages of working for one's self. You may work harder and be paid less but all that buys you flexibility. It buys you the freedom to pursue the work you want in the manner you want. It affords you the ability to pursue interests outside of your main line of work. 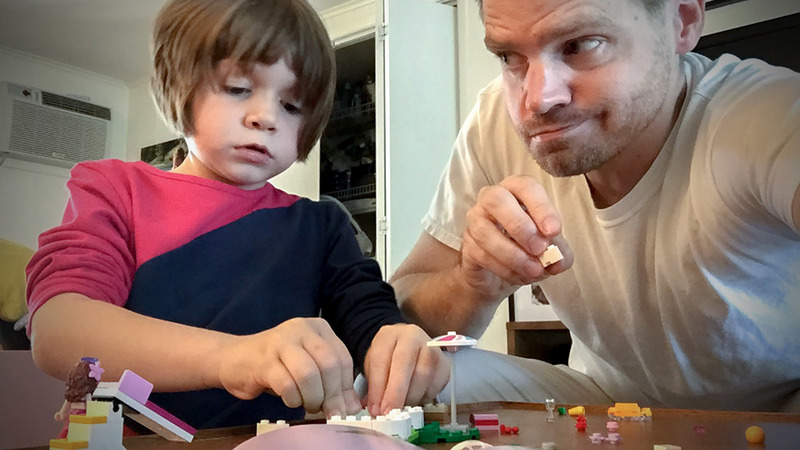 It buys you time to play Legos with your daughter for a few minutes on a Wednesday afternoon.